Happy new year! Here’s our first blog post of the year, introducing our first event of the year. 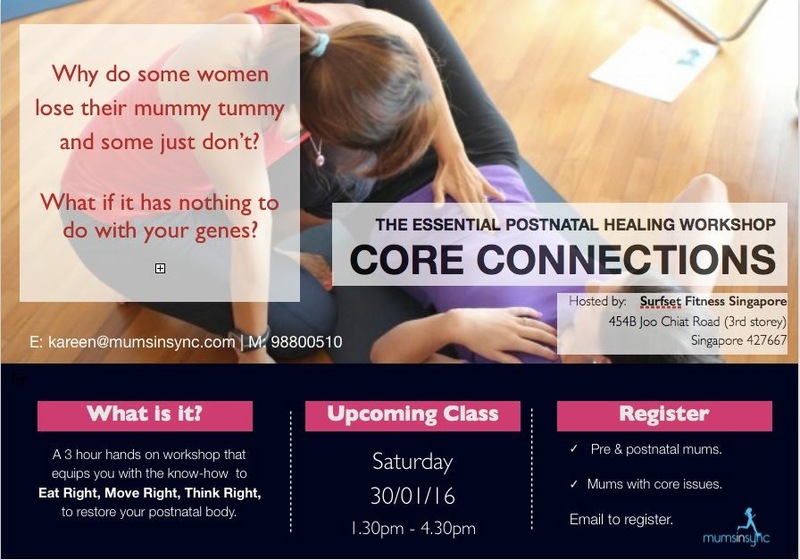 Calling all pre and postnatal mommies out there – we’re holding a workshop called Core Connections! Core Connections is a workshop for pre and postnatal moms looking to enhance and improve their lifestyles through exercise and diet. It’ll be held at our SURFSET Studio on the 30th of January, 2016, and will feature three speakers, Kareen Lai, Benson Poh, and Emilie Tan. Location: SURFSET Fitness studio at 454B Joo Chiat Road, 3rd floor. Program: Understand what happens to your body during and after pregnancy, design a safe workout for yourself, and learn how to make guilt-free snacks!